Favourite Feminist Reads | Collab Post | emma etc. Hi, I'm Sarah from Sarah Eliza. Both Emma and I have decided to team up, swap blogs and share our favourite feminist reads with you. If you want to see some of Emma's favourites be sure to check out that over on my blog but, for now, here are my favourites. This was the book that started it all off for me. It was the first book exploring feminism explicitly that I read. As Frankie heads off to boarding school she soon notices the different treatment the girls and boys get at the school. She doesn't seem to understand why the boys act the way they do as well as being allowed to run secret societies where girls aren't. She challenges the boys' ideas of stereotypes in thinking girls are passive and unmotivated. While some of the feminist points I found a little forced, I think this is a great starting point to feminism in fiction. This was first published in 1892 and, just last year, this 60-page book, was released as one of the 89p Penguin Black Classics. Feminism was a topic I had to cover for me A level English course and this was one of the recommended books and I really enjoyed it. The main woman remains unnamed and is sent to the country to try and recover from her mental illness. The woman wants to write but her husband (who also is her doctor) forbids this and the woman descends into madness and doesn't recover as she becomes obsessed with the wallpaper in her room. Even though only short, it isn't the easiest of reads but still one that I think highlights the feminist issues of the time. Another one recommended to read for my course and covers similar topics topic to the Yellow Wallpaper. Based on Plath's real life, Esther Greenwood moves to New York and starts to enter into a depression. Being a young woman she goes on numerous dates with men, however, rejects most of the ones she meets. While covering, again, the topic of mental illness really well, Plath points out the hypocrisy between men and women at the time and the blatant inequality between the two. I would give an extreme trigger warning to this book with accounts of suicide attempts as well as her shock therapy both the character and Plath both underwent. While I sometimes found the character of Esther hard to appreciate, this is a feminist book I feel all should give a go. I started reading this series actually after reading about it on Emma's blog among many. This book discusses both feminism affecting teens as well as mental illness. It sees three girls come together to create their own feminist group where they hold weekly meetings to discuss topics affecting females along with a bit of college gossip. Each of the series follows a different girl with this one following Evie who is undergoing therapy which she wants to keep quiet as she joins a new school. This is such a good YA read full of feminism, friendship and humour. This book and series is one to try. 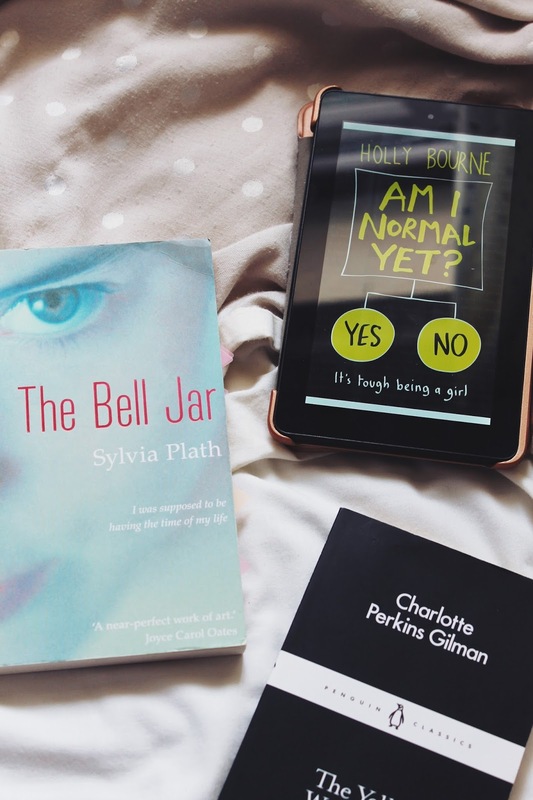 So here are just a few of my favourite feminist reads and if you want some more recommendations why not head to my blog to see some of Emma's favourites. What are some of your favourite feminist reads?